For the second issue of the NCT Magazine, Anna Paternnosto, Vice President of the CBRNe Society interviewed Maj. Gen. Shunji Yoshino, Commander of the Chemical School of the Japanese Ground Self-Defense Force (JGSDF) to share with our readers how the JGSDF is preparing for the Tokyo Olympics and how the organization is facing the ever growing national and international CBRNe threat. Maj. Gen. Yoshino has served the JGSDF for more than thirty years. Before being appointed as the Commanding General of the JGSDF Chemical School, he served as the instructor of the JGSDF Chemical School, the Commander of the 2nd Chemical Unit, and Chief of the Chemical Office at the Ground Staff Office. His recent noteworthy positions include Director of the Logistic Department of the Western Army Headquarters and Vice Commander of the 15th Brigade. From 2005 to 2008, Maj. Gen. Yoshino also served as the Defense Attaché in the Netherlands. Maj. Gen. Yoshino graduated from the National Defense Academy of Japan and attended the commanding and staff activity in the Command & General Staff Course of the Staff College. He undertook the higher military education in the Joint Special Course of the Joint Staff College. Established in 1956, the main mission of Camp Omiya Chemical School is to develop and conduct training to acquire knowledge and skills necessary to protect the JGSDF personnel against CBRNe events, as well as to educate civilian responders, such as representatives from the police, fire service and coastguard on CBRNe Defense. In 1995, Tokyo experienced the brutal consequences of the Tokyo Subway Sarin attack perpetrated on 20 March by the terrorist group Aum Shinrikyo. In five coordinated attacks, the perpetrators released sarin on three lines of the Tokyo subway during rush hour, killing 13 people and injuring around 6,000. In 2011, Japan also suffered from the Fukushima Daiichi Nuclear Power Plant (NPP) accident caused by a massive earthquake and consequent tsunami, which led to the core meltdown of the NPP and the release of large amounts of radioactivity. 23 years from the Tokyo Subway attack and 7 years from the NPP meltdown in Fukushima, Japan is preparing to host two major large-scale events: The Rugby World Cup in 2019 and the Tokyo Summer Olympics in 2020. High visibility events are highly vulnerable to CBRNe terrorism and require security measures in place that allow a fast and effective response. In the light of these events, we spoke with Maj. Gen. Yoshino about how the JGSDF is dealing with the preparations. Protecting High Visibility Events needs strong cooperation between civil and military stakeholders. Is the JGSDF collaborating with other first responders to guarantee the protection of Tokyo 2020 Olympics? 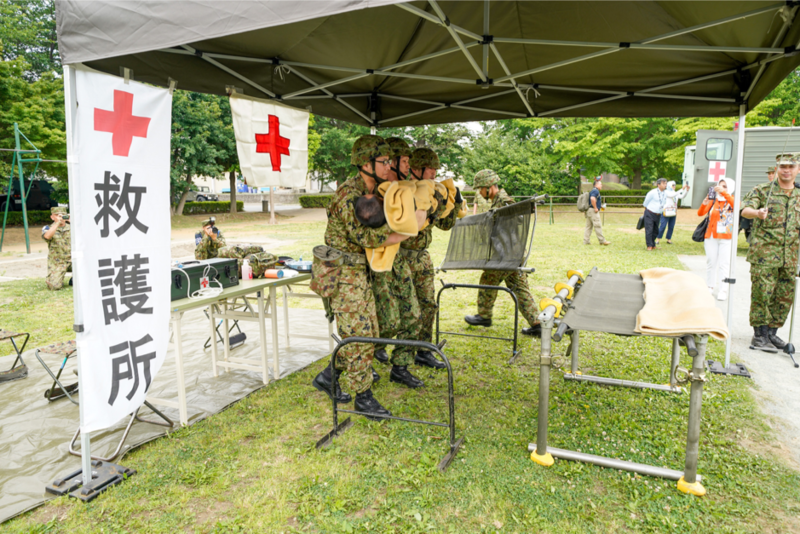 All the units of the Japan Ground Self Defense Force continuously conduct joint CBRNe training not only with firefighters and police, but also with medical personnel and local governments. This falls under the framework of civil protection training. Civil and military responders in Japan are constantly keeping their capabilities ready to cope with CBRNe incidents. The same applies for the Chemical School. We have recently invited representatives of the police and fire department to conduct joint education. An education that is more realistic in order to better cope with potential incidents. An event like the recent NCT Asia Pacific 2018 in Tokyo was a great opportunity to share information on both a national and international level. The JGSDF was able to improve its knowledge through the conference and it was a fruitful and effective event. As there are two more years to go until the Olympics Games and one for the Rugby World cup, has the JGSDF Chemical School already upgraded its capabilities in order to be better prepared to respond to potential CBRNe attacks? Did you undertake any special training in preparation for the Games? One of the Chemical School’s missions is to always research innovative and effective countermeasures to deal with CBRNe threats. We keep developing new training and education techniques for the JGSDF regardless of the events taking place in our country. Ours is an ongoing mission: we need to make sure that our forces have the best training and education to deal with CBRNe disasters at all time. When it comes to the trainings, we always keep our standards very high, which means our trainings did not change in preparation for the Olympics. Our goal is to defend our territory and nation from CBRNe incidents both in time of peace and war. Japan Ground Self Defense Force Chemical School performing a live capability demonstration at NCT Asia Pacific 2018 at Camp Omiya, Tokyo, Japan. Maj. Gen. Shunji Yoshino pictured during NCT Asia Pacific 2018 with Anna Paternnosto, Vice President of the CBRNe Society. As the Commander of the JGSDF Chemical School, how do you see the future development of your Command in the light of the ever-growing international CBRNe threat? What will be the main focus of the JGSDF Chemical School for the coming 5 years? Japan is a country that suffered the consequences of a nuclear power plant meltdown and a chemical attack on the subway system of our capital. In all these events I am confident to say that we have conducted our operations properly as a “sheet anchor”. In the next 5 years there will be a couple of international large-scale events like the Rugby World Cup and the Olympic Games. However there has been no change in the fact that we remain the “sheet anchor” if any incidents would occur. Therefore, we will keep on making every effort to be a center for CBRN defense, not only in the GSDF, but also for the whole country. We will also do that by deepening our knowledge of CBRNe defense through conferences and international exchanges like the NCT events. The JGSDF has recently undergone a sweeping internal re-organization. What was the purpose of this restructuring process and what were the key changes that affect the JGSDF Chemical School? The main reason for the recent large-scale reformation of the JGSDF is the changing security environment around Japan, which is getting more severe. The purpose of the internal re-organization is to improve the effectiveness of joint operations. For instance, being able to deploy units all over Japan in a more rapid and flexible way. In this large structural change of our Defense Force, there is no direct effect for the Chemical School when it comes to our education and research programs. Obviously, we will cooperate with the newly established organizations within the JGSDF to guarantee awareness of our function and capability. Today, the threat of CBRNe attacks dominates news headlines all over the world. Do you foresee that the JGSDF will strengthen cooperation with its strategic international partners to better overcome the evolving security situation? What are in your opinion the main CBRNe threats we are facing? If we look at the international situation as well as to the national security policy of the world’s main powers, it is clear that no one can stay safe by maintaining isolation. The importance of bilateral and multinational security cooperation is becoming always more crucial. Exchanging knowledge in a strategic and more effective way is the key. The attacks and incidents that Japan underwent show us that no country is safe from CBRN threats. It is necessary to share lessons learned from these experiences and to deepen the relations with international partners. When it comes to the main current threats, there are latent threats of terrorist groups using chemical toxics or biological weapons such as the Tokyo Subway attach in 1995. Furthermore, other countries besides North Korea possess CBRN weapons. Finally, let us not forget about the risks posed by the potential diffusion of toxic industrial materials or by the release of volcanic gases.